The research project Ciudades Auto-Sostenibles Amazónicas (CASA), co-coordinated by BUDD alumna Belén Desmaison (PUCP), with the involvement of DPU’s Camillo Boano and Giovanna Astolfo, aims to develops a participatory process with local communities, local authorities and the national government to co-produce sustainable spatialities and promote alternative livelihoods systems in the Amazonas. A CASA proposal was selected as winner for the innaugaral Water Research Prize by a panel of at the World Architecture Festival (WAF). The WAF, held this year in Amsterdam, is dedicated to celebrating, sharing and inspiring outstanding architecture. At the heart of the festival are the awards wherein architects present their completed buildings and future projects live to a panel of internationally renowned judges and delegates from around the world. Among the award catergories is the WAF Research Programme which was launched in order to promote a number of key challenges identified architects will need to address over the next ten years, beginning with water. The CASA project proposed an innovative, community led water management system, designed by a team of students from Pontificia Catholic University of Peru (PUCP) and as a result of a wider research programme coordinated by PUCP and the DPU. The design captures, stores, and treats rainwater and inserts it into pre-existing water networks. 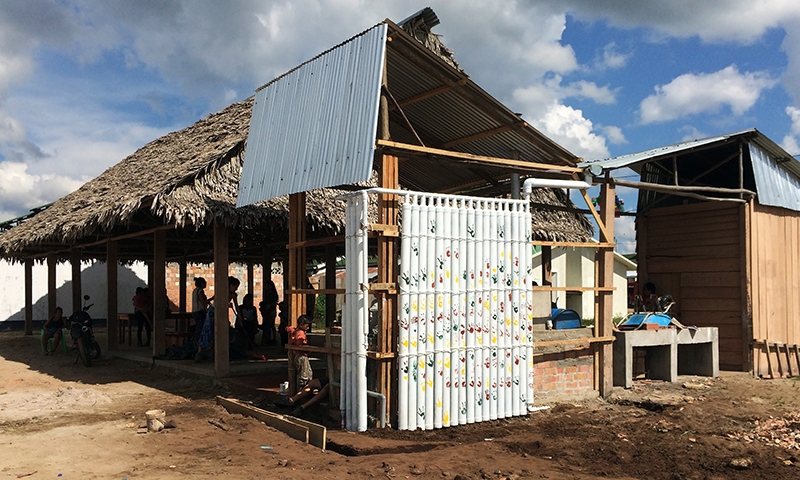 The design team’s focus was to overcome the challenges around the integration of water and sewage provision in the Peruvian Amazon, where only 31% of the population has access to water, despite living in an area with the highest levels of annual rainfall worldwide. Differing from a traditional water tank system, the PUCP team developed a system of tubes that capture, store and treat rainwater, and serve as a non-bearing curtain wall that occupies less space and can be more easily integrated with existing architecture. The number of tubes can be increased or decreased according to the user's water needs. The system also incorporates traditional architectural solutions, such as promoting permeable walls and facilitating cross-ventilation, allowing users to address the high temperatures of the Amazon without the need for artificial systems like air conditioning. By designing an independent system from conventional networks, the designers sought to reduce the costs of implementation and maintenance that they generate. The system is also communal and not individual, therefore reducing costs per family. In the same way, its communal use promotes activities, such as washing clothes and cooking, that generate public platforms for inclusion and dialogue. Having won the prize, the CASA research project will receive a £10,000 prize from GROHE, the world's leading supplier of sanitary fittings, to support further research. The PUCP team beat a shortlist of 12 projects drawn from over 60 entries who were assessed by a panel of experts including Judge Henk Ovink, Special Envoy for International Water Affairs, Kingdom of The Netherlands.